I feel like it has been far too long since my last update! Winchester continues to be the biggest blessing in my life. Chester also has the habit of running full speed at people that he sees, which when I call him he will come back, but I always laugh because he just wants to run up and say hi and give kisses and get some love, but I forget that he is a big dog and people are probably intimidated when he is coming at them. HAHA guess that’s something I need to remember, not everyone knows what a sweet, gentle boy I have. Recently Winchester has become anxious when we travel…. My mom recently moved about nine hours away from me to southern Idaho. So this past weekend I took four days and went to visit her. I took my boy of course. Chester has recently gotten pretty anxious on car rides. He’s fine in town, but when we get on the freeway he gets anxious. Which is weird to me because he has been in the car since I brought him home. I always take him places with me. Unless going to work, Chester rarely stays behind. Not sure what happened, but I got some seditives to give to him to ease him on the trip. I can’t imagine him being anxious for nine hours. He did awesome. A little drowsy, but not passed out, or even stumbly when walking. Just helped him relax I think. Winchester is the greatest thing that has ever happened to me….. I know I have told you that many times but I really mean it. I can’t thank you enough. Also, on a side note. I got a boyfriend. He loves Chester, and Chester also loves him. I remember you telling me the story about the girl that had gotten a weim from you. How she was on the beach with her weim and he like ‘picked’ her husband. I love that story, and I feel a bit like her. He’s so good about Chester, and doesn’t mind how much I love him and baby him. And he treats him awesome. So my life has been going pretty great as of late. I feel so blessed for not only my dog, but for you to have been brought into my life as well. I can never really thank you for all that you’ve done. Anyhow, I am including some pictures. I only have pictures from my phone. But they are great quality so I hope you like that. Winchester sure is an amazing boy!! Hugs and puppy kisses – Jamie and Winchester. 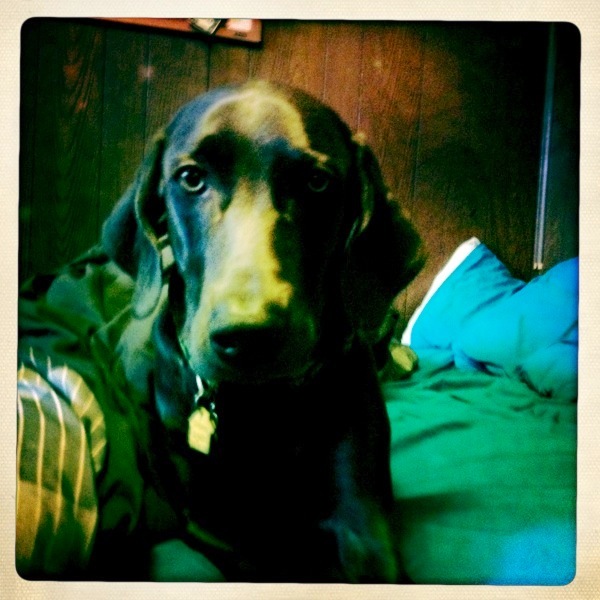 Posted on April 19, 2012, in Maudie X Blue, Previous Pup Update. Bookmark the permalink. 2 Comments. My Izzy has same trait loves people and frequently nips hands trying to break problem other than shock collar. Beautilful weim as well love his name my father use to hunt at a distination called Winchester. Sue write to Cliff for help. I think you should try the system Jamie was talking about too!